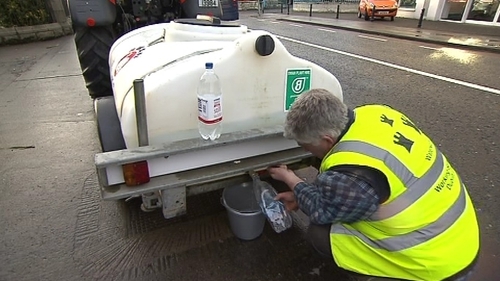 Water supplies are now proving to be a critical problem in some areas, with parts of Cork and all four Dublin local authorities facing shortages. Councils in the capital are making cuts to overnight supply for at least the next three nights. Fingal County Council has cut water supply from 7pm until 7am tomorrow. Dublin City Council has cut water supply during the same period - from 7pm to 7am. South Dublin saw cuts to supply or loss of pressure at 8pm until 6am. Dún Laoghaire/Rathdown has cut water supply in many areas from 7pm to 7am. Cork County Council says the water situation remains critical throughout west Cork and has requested householders to eliminate leaks as demand continues to exceed supply. Water was off in the Bantry area overnight. Kerry County Council has again appealed to householders not to run taps overnight as water levels have dropped significantly in the past week. Demand is said to have increased by 20% since the cold spell began. Meanwhile, conditions on many roads and footpaths around the country remain dangerous following another day of snow and freezing conditions. Further rain, sleet and snow fell in many parts of the country this afternoon and hazardous road conditions persisted following overnight falls of sleet and snow. Temperatures tonight are forecast to fall as low as -9C. Road users and pedestrians are again being warned of hazardous freezing conditions right across the country. Dublin Airport is fully operating as are all Iarnród Éireann services. Bus Éireann services are curtailed, as well as some Dublin Bus routes, but all Luas services are operating apart from the Connolly stop, which is closed. At Cork Airport, there was some disruption to the flights schedule caused by weather problems at Edinburgh, Glasgow and Heathrow airports and travellers were asked to contact their airline directly before going to the airport. Black ice is also a problem in Kerry, where gardaí are warning road users, especially in the north of the county, to exercise caution on all roads, particularly local roads. The Conor Pass remains closed.